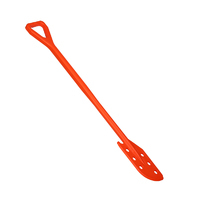 Strong colour coded paddles and stirrers with short or long D-grip handle. Chamfered, curved leading edges for effective movement of residues. Through-holes help to achieve maximum effectiveness in stirring and unique hook feature assists retrieval of cooking nets etc. Up to 7 colours in support of segregation avoids cross-contamination. 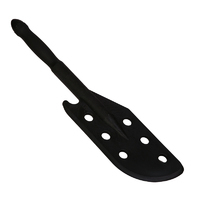 Klipspringer paddles are available in long or short sizes in standard, detectable or high-heat resistant polymers. View the range below, any orders received before 4pm are dispatched same day. 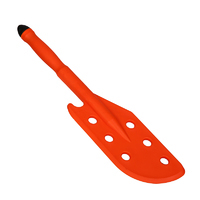 Colour coded one piece paddle with holes, available in up to 7 colours. Chamfered scraping edge follows the curves of cooking vessels, whilst the hook feature at the top end facilitates a good grasp on cooking nets etc. Colour coded paddle head with holes, in up to 5 colours. Chamfered scraping edge follows the curves of cooking vessels, whilst the hook feature at the top end facilitates a good grasp on cooking nets etc. Complete with long stainless steel handle makes this article ideal for deep vessels. 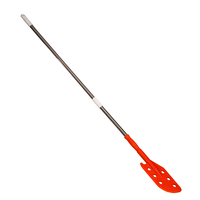 Colour coded short handle paddle with holes, in up to 7 colours. Chamfered scraping edge follows the curves of cooking vessels, whilst the hook feature at the top end facilitates a good grasp on cooking nets etc. Ideal for work in shallow or easily accessible liquids. 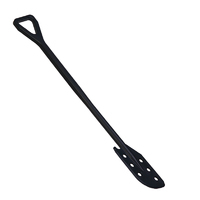 Suitable for use where sustained immersion or extended contact is made with high temperatures (<240˚C). Chamfered leading edge follows the curves of cooking vessels, whilst the hook feature at the top end facilitates a good grasp on cooking nets etc. Complete with long stainless steel handle makes this article ideal for deep vessels. 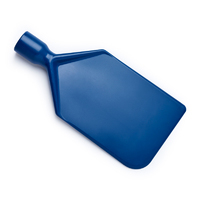 Suitable for use where sustained immersion or extended contact is made with high temperatures (<240˚C). Chamfered leading edge follows the curves of cooking vessels, whilst the hook feature at the top end facilitates a good grasp on cooking nets etc. 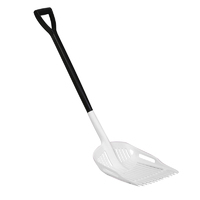 Deep pan configuration for shovelling bulk material, with protruding tines beyond crossbar to facilitate easy pick-up. 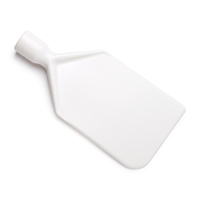 Flexible polyethylene paddle scraper blade that easily conforms to the contours and curves of any cooking surfaces and tight cleaning areas. 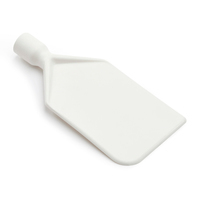 Nylon paddle scraper blade specially molded to allow for easier cleaning on curved surfaces.